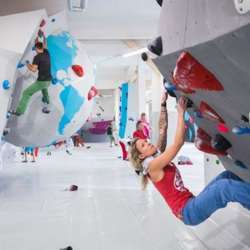 You must be a member of the Frankfurt Bouldering & Rock Climbing Group to attend this activity. Would you like to join this group? A single entrance fee is 9.90€ (there are other types of tickets for regular attendance) and you will have to sign up to hall's database if it is your first time there (something usual in all bouldering halls that I have visited). Renting bouldering shoes costs 4.00€. The hall has changing rooms (lockers and showers) and it is possible to buy snacks and refreshments there.